I I t’s 6:30pm on a Friday, and the line at chef Mark Ladner’s newly opened Pasta Flyer is curling down the steps. Since the doors opened at 5pm, a steady crowd has been filling up on organic fusilli with basil pesto, and whole grain rigatoni with Nonna’s meat ragu. The plush floral benches complement the flowers that stand on each table, unless of course you’ve scooted them to make room for a second tray of pasta. Portions are a decent size, but it’s hard to stop ordering, especially when each dish is so cheap. A bowl of pasta, ranging from $7 to $8 ($9.99 if you add a side and a San Pellegrino) costs less than a burger at the neighboring Bagel Buffet, or a burrito with guac from Chipotle. This is a new type of fast food: satisfying, cheap -- and created by an expert chef. Until recently, quick-service pasta invariably meant lackluster, overcooked mush, reheated behind a cafeteria sneeze-screen. Now, suddenly, Manhattan is turning up tons of restaurant-worthy pasta you can grab on your lunch break. Two miles south of Pasta Flyer sits the Sosta, a millennial-pink haven of fresh pasta and Instagram-ready brunch boards. 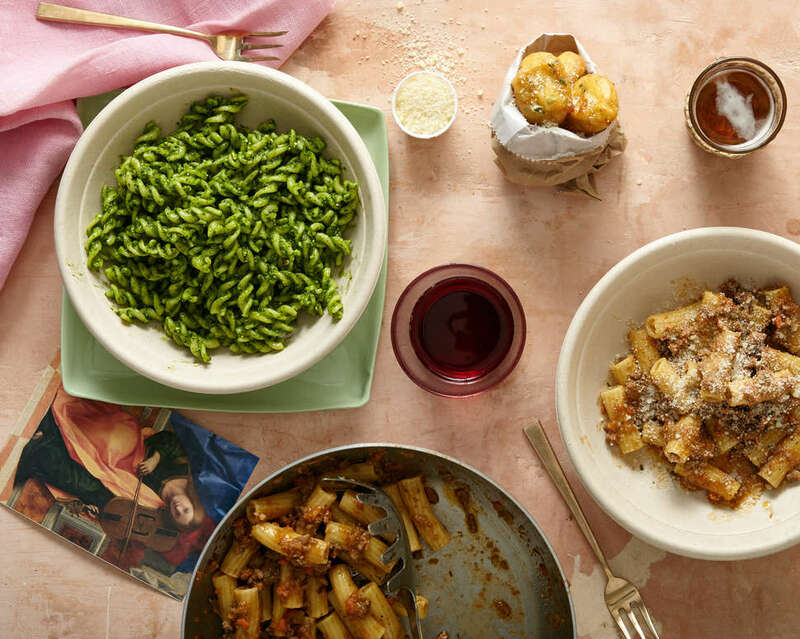 It’s the work of creative director Samantha Wasser (formerly of By Chloe) and chef Ali LaRaia, who was inspired by the Italy’s gas station pasta to create an on-the-go equivalent in New York. Open since July, the Sosta already has plans to expand broadly, like its estranged vegan cousin, By Chloe. Now that the big names have arrived, there’s no going back. 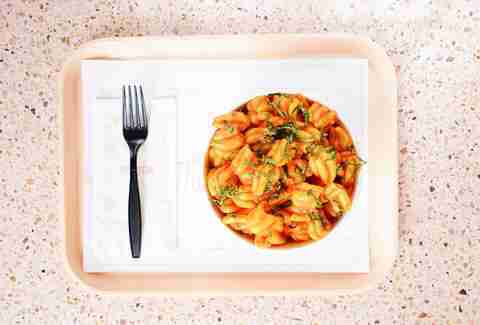 Pasta Flyer and Co. are launching New York into a new era of carb-fueled fast food. The dream of “pasta for the people” boiled up in Ladner’s mind nearly five years ago, while he was the executive chef of Del Posto. In 2014, he launched the first iteration of Pasta Flyer as a side hustle. Ladner and his business partner, Nastassia Lopez raised $85,000 via Kickstarter and used the funds to tour six college campuses in six states, selling quick-service, gluten-free pasta and using sales data from Square to build a business plan. In the year that followed, Lopez enrolled in business school, developed the model, and found an investor. Ladner focused on the pasta. This is a new type of fast food: satisfying, cheap -- and created by an expert chef. Thus, the concept was born. Still, he hadn’t found an Italian precedent for fast, good pasta. Instead, he looked to Japan, “where noodles are a viable and even preferred form of fast food,” Ladner says. 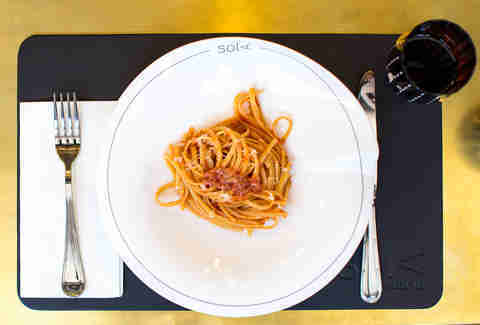 A $9.99 meal deal at Pasta Flyer is a fraction of the price of a tasting menu at Del Posto -- or pretty much any sit-down restaurant in Manhattan. And Ladner isn’t the only chef moving from Michelin stars to fast-casual. Former Del Posto pastry chef Brooks Headley left to launch vegan-patty specialist Superiority Burger in 2015, and even Eleven Madison Park now has its own “fast fine” derivative, Made Nice, which serves protein, veggie and grain bowls under $20. With high quality coming so cheap and accessible, it’s easy to wonder: Are New Yorkers being duped into exorbitant pricing by flashy marble staircases, hard-to-secure, easy-to-covet reservations, and leather-bound menus? Pasta Flyer and its ilk have much lower overheads -- there are no hosts, sommeliers or servers, and no linens to fold, silverware to polish, or glassware to replace -- yet the product itself is superb. Ladner imports dry pasta from Italy (he prefers its texture to the supple, fresh stuff); the sauces are all homemade; and while the food is no work of art, it’s neatly presented. Manhattan is turning up tons of restaurant-worthy pasta you can grab on your lunch break. Ladner felt bad asking his peers to visit Del Posto and taste his work, which could almost cost them their week’s wages: “It just seems odd after a while, when you’re constantly cooking for people who are wildly outside your tax bracket, all the time.” Pasta Flyer isn’t reinventing the spaghetti bowl, nor trying to create the next Instagram sensation, but rather serving familiar flavors, expertly cooked. 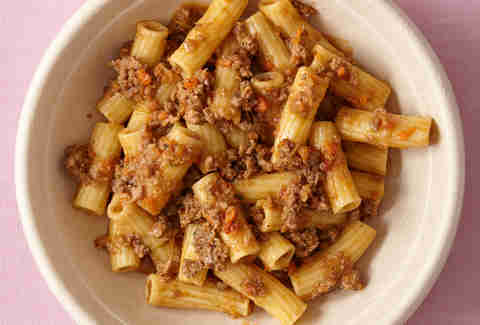 The menu features just five classic pastas. Leveraging old industry relationships has also helped Ladner keep prices affordable, and he hopes to buy ingredients in higher volume at lower cost, too. The master plan is to bring something like healthy fast food to the masses. 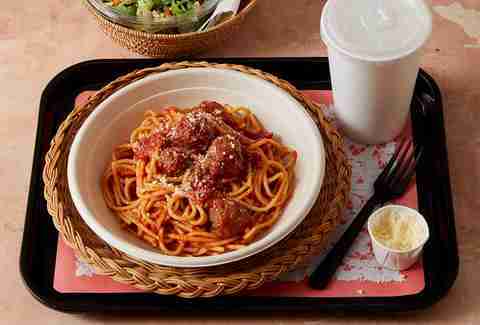 But before Pasta Flyer can become anything like the McDonald’s of pasta, he’s focusing on making the first restaurant a success. “I don’t know [about being the McDonald’s of pasta]; maybe that’s too boastful,” Ladner says, “We think that it has the potential to be. We think that fast food doesn’t necessarily need to have a negative connotation and it can also be healthful.” An order at Pasta Flyer, from arriving at the counter to swiping a credit card, takes 30 to 40 seconds. Now, fast pasta is on the rise, with businesses like Pasta Flyer, the Sosta, Sola and Pasta Wiz blazing the trail. And while New York is hardly teeming with tasty, quick service pasta (it’s not poke, after all), expect the carb game to only get stronger in 2018.